I haven't written much about Kiev. I mostly wrote about Zorki, Zenit and Fed. But I hope to make up for it with this article. Which describes the Kiev 4 series. The Kiev 4 is an excellent rangefinder from the Ukraine and was built by Arsenal in the city of Kiev. I will not go into the history of the Kiev cameras, that would require an article of its own seeing that the history of Kiev is a most interesting one. And a tale deserving its own article. But a small introduction is needed. After the Second World War, or the Great Patriotic War if you will, the Russian Army took the Zeiss Icon factories, dismanteled them, stuck them on a train and transported them to Kiev. There they were rebuilt and Arsenal Zavod started to build, Contax Cameras but they called them Kiev. Arsenal Zavod was a military factory but switched to these highclass cameras in 1946. The lens section from Zeiss went to KMZ. Since Arsenal had a reputation of high standards the cameras reflected that. The Contax copy called Kiev was not only pretty good but even rivaled the Contax in quality. And in units produced. 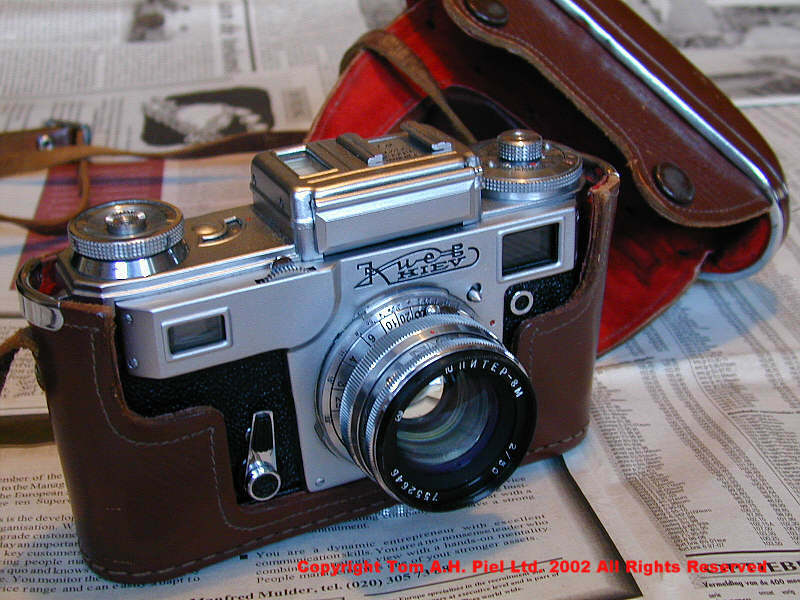 The Kiev 4 is a rangefinder which is very well built and there are a few things that catch the eye. It is a wide based rangefinder, it uses a bajonet mount (Contax bajonet to be precise) and it has a lot of speeds. It can come with or without a lightmeter. This one has a lightmeter. This one was produced (as the 4M with some slight differences) right up to 1987! The Kiev 4(b) with its lightmeter opened and closed. This one is from 1975 and is in good shape. I bought it through Ebay. The Kiev comes with a nice leather every ready case. Brown with two snaps at the back and lined with a kind of red fabric. 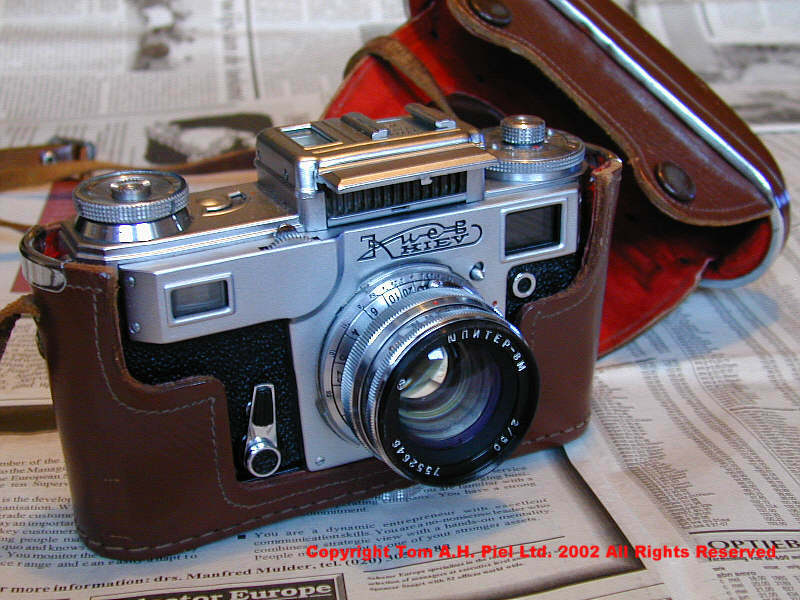 This Rangefinder is not based on a cloth shutter but on a metalic curtain shutter. Moving not horizontaly but vertically. This means that it doesn't suffer from the pinhole problem that plaques the Zorki and Fed rangefinders. But you still have to check the Kiev's for lightthightness. They can have a problem not being lightthight at the back. Not an uncommon problem among Rangefinders with a removable back. 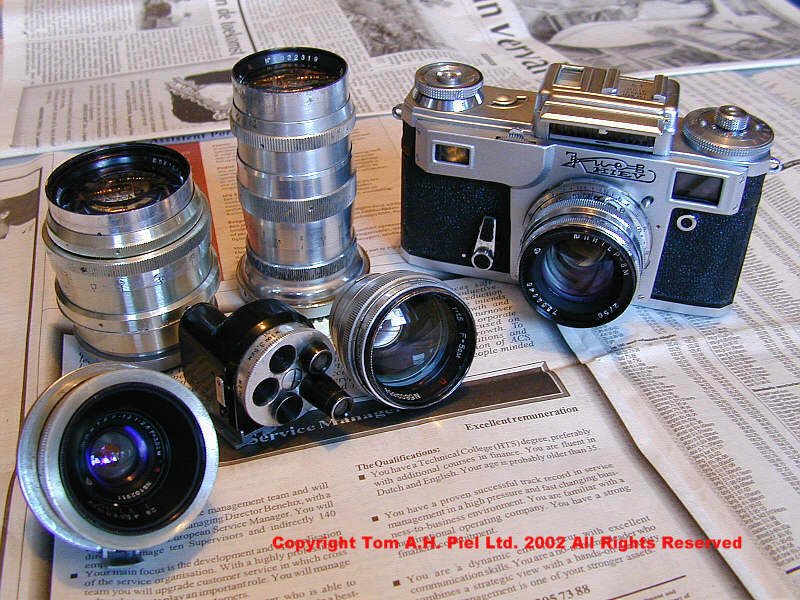 A Kiev 4 set with the lenses. From left to right, left front, the Jupiter 12 2.8/35mm, middle front, the universal finder (the must have handy gadget), front right, the Jupiter 3 1.5/50mm, back left, the Jupiter 9 2/85mm (Best portretlens ever?) and back right, the Jupiter 11 4/135mm. The shot next to it is a comparison shot between two very fast lenses, the Helios 103 1.8/53mm and the Jupiter 3 1.5/50 mm. As said the Kiev uses a Bayonet mount, in fact there are two, an internal and an external bayonet. The J9, J11 and J12 all use the external bayonet and fit right over the entire distance ring of the mount, the J8, Helios 103 and the J3 all use the internal mount. When using the internal mount you can focus very wel with the little wheel above the rangefinder window, this is actually there for focussing. Pretty cool, allthough with the J9 and other external mount fitted lenses I rather use the normal way, the wheel works then also but much harder. Not in these shots are the two Kiev 4's that have no lightmeter. 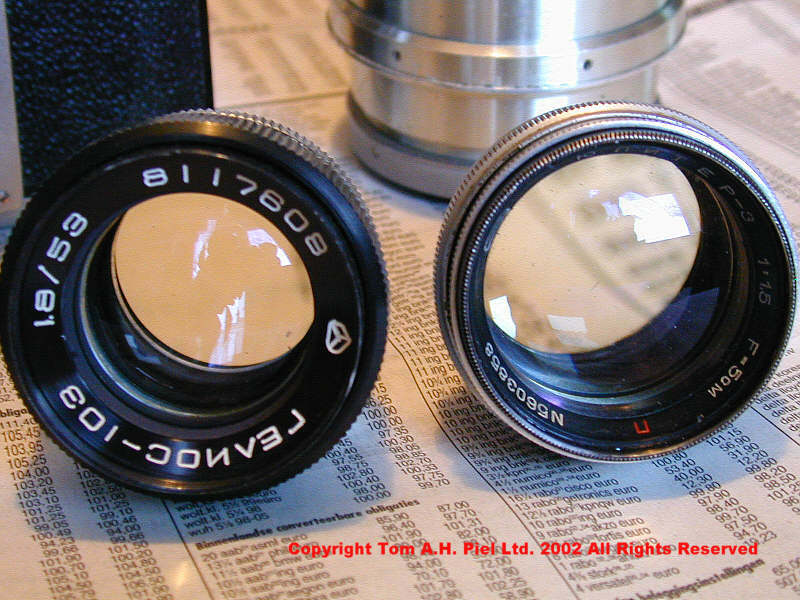 The Kiev 4M and 4AM. To be honest I like them best off all. They are pretty and have all the advantages of 4's but without the selenium meter to cause problems. Nope.... not yet, I'm still shooting. This article will be rewritten also as soon as I have some proper shots.